January 13, 2010, Washington, D.C. The Governments of the United States of America and Japan convened a plenary meeting at the Department of State in Washington, D.C. on January 13 to review and discuss cooperation in the civil use of the Global Positioning System (GPS) and GPS augmentations, including Japan's Multi-functional Transport Satellite (MTSAT) Satellite-based Augmentation System (MSAS) and Quasi-Zenith Satellite Systems (QZSS). The GPS consultations are held regularly pursuant to the "Joint Statement on Cooperation in the Use of the Global Positioning System" signed by the two Governments on September 22, 1998. During the meeting, the United States (U.S.) representatives described the status of GPS modernization and the United States' international GPS cooperation with third parties. Representatives of the Government of Japan reported on the status of the MSAS and QZSS programs and on Japanese international Global Navigation Satellite System (GNSS)–related cooperation activities. Both Governments reaffirmed the importance of providing open access to space-based positioning, navigation and timing (PNT) services for peaceful purposes, free of direct user fees. GPS and its augmentations have become an integral part of modern life in the U.S., Japan and the world, providing essential services and increased efficiencies in a broad range of applications, such as aviation and maritime safety-of-life, geodetic surveying, car and personal navigation, mobile telephone timing, international financial transactions and electric power transmission. Representatives of both Governments reviewed the ongoing work of the GPS/QZSS Technical Working Group (TWG), which was established to foster close cooperation during the development of QZSS. 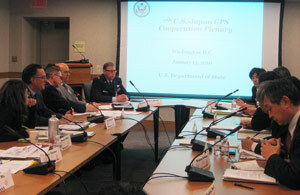 The TWG reaffirmed that GPS and QZSS are designed to be compatible and highly interoperable. Both Governments noted with satisfaction that the Japan Aerospace Exploration Agency (JAXA) and the U.S. National Oceanic and Atmospheric Administration (NOAA) have completed the installation of a QZSS Monitoring Station (MS) on NOAA property in Guam. A similar effort between JAXA and the U.S. National Aeronautics and Space Administration (NASA) to establish both a QZSS MS and a Two-Way Satellite Time and Frequency Transfer station at a NASA facility in Hawaii, in support of Japan's National Institute of Information and Communications Technology (NICT) and the U.S. Naval Observatory (USNO), is nearing completion. Both Governments intend to continue cooperation in protecting spectrum used for GNSS and also discussed the importance of pursuing the interoperability and compatibility of all current and planned GNSS with GPS and QZSS. This 7th Plenary meeting strengthened cooperative relations between the United States and Japan. Both Governments acknowledged the important future contribution of QZSS to the space-based PNT services of Japan. They affirmed that continued close cooperation in the area of satellite navigation will contribute to the peaceful development of the Asia-Pacific region and promote global economic growth. In that regard, both Governments welcomed the Asia Oceania Regional Workshop on GNSS to be held in Bangkok, January 25-26, 2010, and the Asia Pacific Economic Cooperation (APEC) GNSS Implementation Team meeting to be held in Seattle, Washington, June 21-24, 2010.